A camp stove is charging an iPhone. The iPhone is playing collected YouTube videos of the bombing in Syria, with the moment of the hit—of the smoke cloud formation—blacked out. A pan, fed with popcorn kernels, cooks on the stove. The iPhone videos feed the pan. Paralyzed amidst the events happening in Syria, and watching them unfold on the computer or telephone screen, he is a bystander: a popcorn eater and a war beholder. Explosions with their smoke clouds are ephemeral sculptural masses erected in cities that they coercively flatten. Popcorn flattens the artist's engagement with the disaster into the surface of the screen. 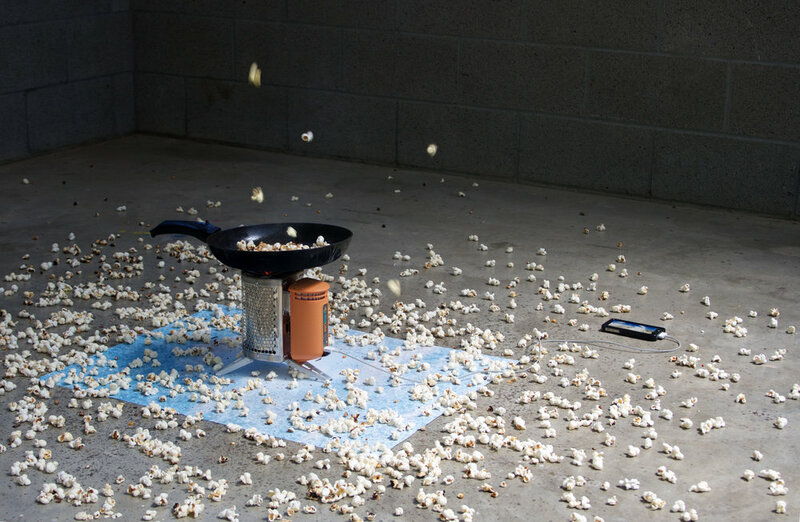 Popcorn is a sculptural translation of watching, a timid explosion that formally conjures smoke clouds, augmenting a precarious aesthetic take on disaster. Explosions on the field decode into popcorn inside the artist’s studio: sculptures of futility, helplessness, and frustration.